NKBA California Capital is the local chapter that brings together local California Capital Kitchen & Bath distributors, retailers, remodelers, manufacturers, fabricators, installers, designers, and other professionals – and provides a resource for local consumers to research, educate and connect with California Capital Kitchen and Bath professionals. Click here to visit the NKBA California Capital website. Bridget Bueche’s speaking engagements are seasoned with passionate, fun, lively, true-life anecdotes from her time spent as a private chef, director of culinary, and overall catering “magic” maker for personalities, stars, politicians, physicians, families and spiritual leaders alike in kitchens all over the world. Bridget promises to entertain and educate, as you learn how to discover your customers individual “cook’s perspective”. Successful people are able to attract others to their ideas, their goals, and their objectives. They have that indefinable something that causes people to take notice of who they are and what they are up to accomplishing. Bring your poker face, eat, drink, and be Irish! Presented by NKBA, hosted by Premier Bath and Kitchen. Grab your Lebrechaun hat and Irish wear, have your photo taken and try your luck at our casino gaming tables. Blackjack, Craps, Roulette, and Poker. ALl for a chance to win one of our many prizes. We will also have prizes for the best dressed lady and gent. Your admission for the evening includes $1000 in chips to start the night, buffet dinner, drinks, and loads of fun. You have got to try your luck and purchase your ticket today! $35.00 per person. 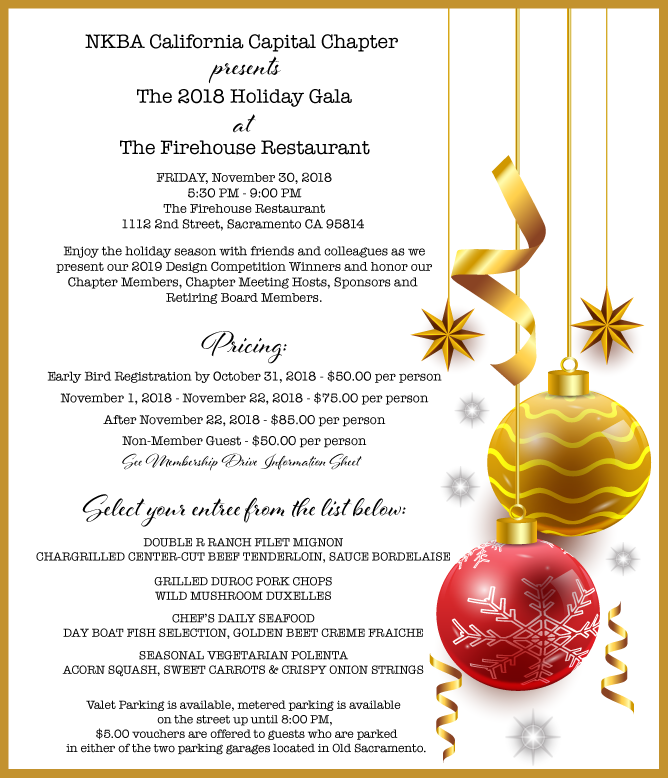 Enjoy the holiday season with friends and colleagues as we present our Design Competition Winners and honor our Chapter Members, Meeting Hosts, Sponsors and Retiring Board Members. NARI of Greater Sacramento and NKBA Capital Chapter will have a joint meeting, friendly competition & donation drive on November 8th. THE CHOPPED CHALLENGE Two chefs from each organization will show off their culinary genius & talents as they face off against one another to prepare a spectacular entrée and dessert. The catch? Both teams will have to use all the pre-selected ingredients, however unlikely they might be. The panel of judges will critique in terms of taste, presentation and creativity. YOUR CHALLENGE We challenge you to donate new or gently used blankets, coats, hats, gloves and scarves. We don’t want to forget our furry friends, so we are also collecting blankets, towels and pet sweaters for the local SPCA. Join us as we partner with Fishes and Loaves of Sacramento. EVERY DONATION RECEIVES AN EXTRA RAFFLE TICKET. 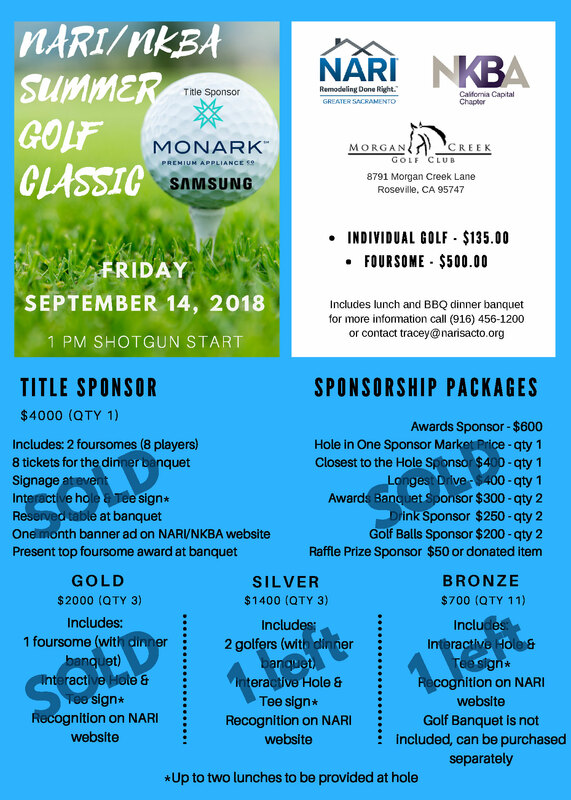 2018 NARI/NKBA Summer Golf Classic is an annual event that raises money for ACE Mentoring. The Golf event includes lunch and BBQ dinner banquet. STILL ONE BRONZE SPONSORSHIP AVAILABLE! This course, presented by Erica Dockery, Designer Account Executive for Sherwin-Williams Northern California, will focus on paint technologies you can specify to help improve the quality of your client’s home with respect to indoor air quality, odors, mold and mildew and disease-causing bacteria on painted surfaces. You will learn how to find paints and coatings that are 3rd party-certified so that you can recommend a product with confidence. Finally, you will learn strategies for incorporating natural elements with biophilic design theory. 1. Understand the evolution of the Healthy Home Movement. 2. Learn about breakthrough paint and coating technologies that can help improve indoor air quality throughout the home. 3. Understand how 3rd party certifications improve transparency and increase confidence in specifying products. 4. Discuss strategies for incorporating nature by applying biophilic design theory. Have you ever wondered which shower systems are best suited for individual clients, while still considering water conservation? In general, water conservation, especially in California, doesn’t have to affect a ‘spa-like’ experience in the shower. With this presentation, we will discuss the importance of water conservation and its benefits. We will discuss the methods that can be employed to reduce residential water use for sustainable projects based on codes, standards and guidelines, while meeting the clients’ needs for a ‘spa-like’ experience. We will also learn about specifying showerheads, the various types of shower head water-delivering technologies and the different types of shower system valves and how they help with water conservation. You may know countertop basics and the primary surfaces options. But, do you know the specific differences between them and how to gain client confidence by helping them decide the best option for their lifestyle, preferences, and long-time (if not LIFE-time) happiness? Go beyond the initial “color and price” factors and become a more insightful, effective, and competent specifier. Do the harder work early and avoid unhappy callbacks. Find out what you did not know that you did not know and learn to ask the right questions. BONUS: Many (if not all) of the goals and topics reach beyond countertops and can be applied to many other products and design and building categories. Join us for an elegant dinner and artistic and musical affair, celebrating the freshest organic products from our local region. 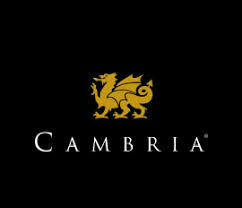 With passion and dedication, we will immerse you in a sensory adventure with a scrumptious menu that will truly delight! 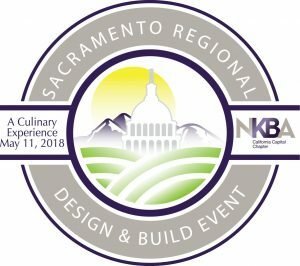 The NKBA California Capital Chapter is proud to present, the 2nd Annual Sacramento Regional Design & Build Event on Friday, May 11, 2018, held at the Greek Orthodox Church of the Annunciation in Sacramento, California. The event will include a gourmet ‘Farm-to-Fork’ themed dinner presented by Hawks Restaurant and Hawks Provisions and Public House, as well as a live performance by the acclaimed David Garibaldi, live auction with David Sobon Auctions and live musical entertainment by Top Shelf Classics. Money will be raised through the evening’s live auction to support Habitat for Humanity of Greater Sacramento. Funds are also being raised to protect our NKBA members’ right to practice, provide educational scholarships, and continuing educational credits for our membership. Presented by Tim Vislay, Director of Sales for Legrand, this CEU program will focus on lighting, lighting controls and systems and home integration. The presentation begins with the effects of lighting on design and it’s impact on the home. Questions about lighting itself and a focus on the different emerging technologies will be answered. There will also be a discussion on controls and their impact on efficiency in buildings and homes as well as the ability to control the lighting and other systems in the home. This event qualifies for 0.1 CEU. Victoria Price with share resourcing tools for life and design. These include discovering your magic wand, learning to inhabit liminal spaces, resourcing from your own history and asking the right (although sometimes tough) questions. This tool kit will help you develop meaningful connections with your clients and your vendors, as well as create a brand that reflects your most authentic self. Hosted By American Olean. Sponsored by Laticrete. Presentation: Join us as Linda Sanford, Lighting Designer from Sanford Lighting Design, discusses Good Lighting Design. Light is a very strong element in any space, indoors or outdoors. Linda will present ways to think about light and use it as a tool to complement the design intent of a space. We will look at elements of a good lighting design and how to think about developing a concept. Then we will look at characteristics of light and how to determine what outputs, what kind of color characteristics and what light distribution, we need to create what we have in mind. Then we will look at definitions of energy efficiency and how to select the best option. We will look at California’s Title 24 to see what is required for residential lighting design both in terms of fixture selection and controls. Speaker: Linda Sanford is a bay area lighting design who has practices lighting design and taught lighting design classes for many years. She has a Masters in Architecture from UCLA and a Masters in Lighting from Rensselaer Polytechnic Institute (RPI) in Troy, NY. she has published articles on lighting and spoken at lighting conferences. She is currently working on residential as well as church projects. She is the current Chair of the ducation Committee at the Illuminating Engineering Society (IES), San Francisco chapter. This presentation is eligible for 0.1 CEU. This is a NKBA CA Capital Chapter Event. Boomer vs. Millennial The Great Design Challenge! Hosted by Cosentino. Sponsored by ProKitchen – Professional Kitchen Design Software. 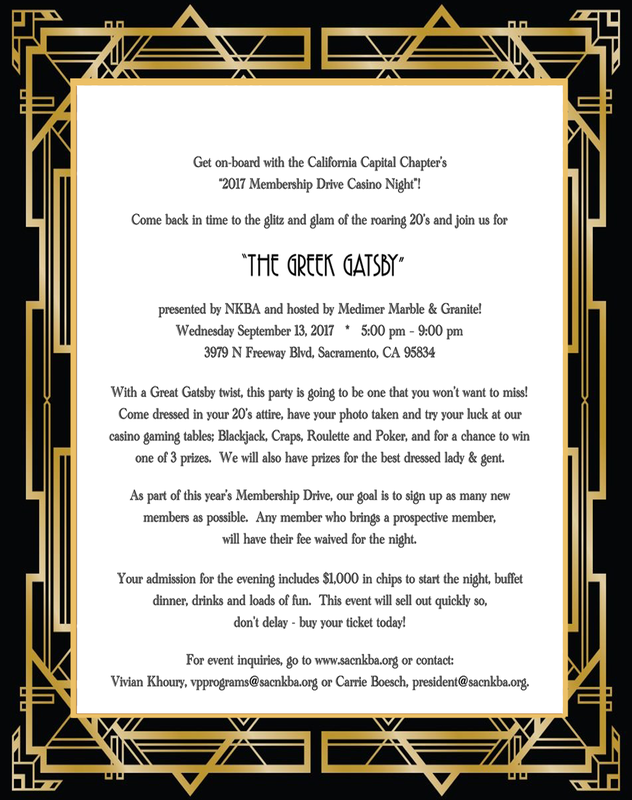 Get on-board with the California Capital Chapter’s 2017 membership drive, running from July-September! Boomer vs. Millennial: The Great Design Challenge! About the Speaker: Traci Kloos is the Senior Design Manager on the Tarkett Residential Design team located in Cleveland, Ohio. She brings with her more than 19 years of design experience in the residential field. With a background in architecture and interior design, Traci began her career as a residential kitchen and bath designer in the St. Louis, Missouri market. She joined Masco, on the KraftMaid Cabinetry brand team, in 2000, as a designer with their design services group. In her 14 tenure, Traci moved into a Senior Designer position, where she spearheaded all photography, PR, and trade show booth designs for the brand, before taking on the role of managing the design services team. In 2009, she accepted a role as Senior Product Designer on the Masco Cabinetry team where she focused on color development, trend analysis and all new product design introductions for the KraftMaid brand. In January of 2014 she joined Tarkett, the largest manufacturer of resilient flooring products in the world. In her current position, Traci, along with the other members of the residential design team, collaborate on new designs, textures and colors for the residential flooring market. Traci also works with the Marketing team to enhance the value of the brand through color and design, tracks market trends and contributes to the brands social media campaign. Each presentation is eligible for 0.1 CEU. Please join us for an engaging conversation with our local Building Officials. Joe Cuffe is the Building Official for the City of Rancho Cordova. Joe has been working in Building Code Enforcement for over 20 years, starting as a permit technician, and working his way up to Building Official. He works with a team of ten staff members, and is responsible for issuance and inspection of over 3,000 permits a year. He is a member of the California Building Officials, International Code Council, National Fire Protection Association, International Association of Plumbing and Mechanical Officials, and currently serves on the Board of Directors for the Sacramento Valley Association of Building Officials. Howard Williams is the Principal Inspector for the City of Rancho Cordova. Howard began his career as a licensed contractor for a number of years, then as a building inspector for Sacramento County. Howard joined the City of Rancho Cordova when the City incorporated, and was made Principal Inspector in 2006. He currently over sees the City’s three inspectors, in-house plan review, and three permit technicians. Robert has been with Sacramento County for over 30 years. He began his career as a Residential inspector plan reviewing and issuing permits at the Public Permit Counter, downtown service center. He has held the positions of: Residential and Commercial field inspector, Residential and Commercial Plan Reviewer, Commercial field inspection supervisor, Assistant Civil Engineer, Sign inspector and the short lived OSPI, On Site Permit Issuance, program. He is an ICC certified Building Official, Plan Examiner, and Building Inspector. Robert completed the BOLA, Building Official Leadership Academy program through CALBO (California Building Officials) and was appointed to the position the Chief Building Official position in February of 2016. He was selected for the permanent position in December 2016. Randy’s 30 years of experience in building, architecture and park and open space development arena began with his studies in architecture in the Big Sky Country of Bozeman, Mt. Randy has used his BA and MA Degrees in Architecture from Montana State University, Bozeman, Mt., and his California General Contractors License to serve multiple private clients prior to his work for the City of West Sacramento as Architectural Projects Manager, City Architect and Building Official. Randy served as one of the team leaders for West Sacramento’s team of residents, staff and other agency partners to develop the program, design and construct the new Community Center and Civic Center campus that includes the City Hall, Community College, Library, Community and Transit Center. During the project’s development, Randy spoke extensively to local and regional groups. His affiliations include the American Institute of Architects, California Building Officials, Sacramento Valley Association of Building Officials (SVABO Past President), and the US Green Building Council. Randy serves on the California Alfred E. Alquist Seismic Safety Commission. A Tour of the Stikwood Workshop will be arranged by the Host. Eric answers how sustainable choices impact economic, environmental and social aspects in today’s bathrooms. He defines what constitutes sustainable products and how to identify them. You will learn how certain manufacturing processes can be used to increase the sustainable nature of a product and what third party certifications are. Overall, Eric will detail how to use less energy and water, building with durable materials that are sustainably sourced and how that contributes to sustainable design. As a National Sales Manager for more than a decade, Eric’s passion for people is evident in everything he has done. The unique roles of sales people, consumers and artisans motivates Eric to keep learning. Our relationship and opportunities to care for our environment inspires him to share. His down-to-earth persona is a perfect balance to his wide and thorough knowledge of the decorative plumbing world. The program will discuss how businesses can get a better understanding of the market today in regard to servicing their customers within the digital disruption going on. You will gain a better understanding of the different types of tools available to keep your services relevant, and of your own value in the scheme of business today. With many different design opportunities, we can provide an appliance that offers control, energy efficiency and safety, while looking fabulous in every kitchen. Induction Cooking in Today’s American Kitchen teaches us how induction technology works and how it benefits the cooking process. This presentation answers a variety of questions about induction cooking, including how it works, what type of cooking pans are required and why induction is a demand item with consumers looking for a modern cooking kitchen. Ace has worked for BSH Home Appliances for nearly 15 years with experience with Bosch’s small appliance products in sales, customer service, product marketing and national service manager. For the past five years he has been a national product trainer for the western U.S. Lives in Antelope, CA and loves meeting new people. Presentation Information: This presentation will review the details that need attention when specifying luxury appliances in today’s kitchens. Information will include remodeling aspects vs. new construction. With so many options available, it’s good to know ahead of time how cabinets, countertops and appliances can be easily married so you and your clients don’t end up divorced! About the Presenter: Kristien Stevenson of Full Circle Designs has been an Interior Designer since the mid ’80’s & has specialized in high-end residential interior design & remodeling since 1993, after receiving her Bachelors degree in Architecture from the University of Washington. She’s had the pleasure of owning her own design businesses in Seattle, WA, Tucson, AZ & now Sacramento. She has also worked as Lead Designer and Design Manager for design/build firms in all 3 cities. In 2014 she transitioned into designing showrooms for a luxury appliance dealer with 20 locations in CA, NV, AZ, and FL. In the past 2 1/2 years, she has designed & worked on well over 100 kitchen vignettes. Kris has been an active member of NKBA & served on the Board of the CA Capital Chapter for 3 years. She is also an Allied member of ASID and is CAPS certified. Designing Today’s Bathroom. Go Curbless Go Big! Trends and emerging design challenges of today’s bathrooms. Mike has a unique perspective as an contractor/installer and discusses some of the issues that arise as we move toward curbless showers and wet rooms in bathroom spaces. Registration ends Friday, Nov. 18, 2016. This course is designed to help learners understand the unique and growing challenges of design within limited interior spaces. What are the drivers for increased demand for universal spaces? What should a design take into consideration? Where could we find inspiration for minimal spaces? Yana has a degree in Business and Marketing and has been working in the Plumbing Industry for 10 years. Her knowledge of the commercial and residential plumbing design and available products is extensive. She is a member of AIA and ASID. This presentation is eligible for 0.1 CEU – NKBA & IDCEC / ASID. Panel Products Night – Advantages and disadvantages of surfaces? Join us for an industry discussion panel with Genise Hood-Plessas – Medimer Marble & Granite, Michael Tigue – Modern Tile Supply, Kevin Stillian – Natural Stone Design Fabrication & Dan Doxan – Scythia Tile and Stone, Inc., as they cover current & emerging surface materials including large format tiles, manufactured slab surfaces, and natural stone slabs. We will address the materials’ pro’s and con’s, fabrication, installation, supplier and challenges. Hosted by NAR Fine Carpentry. Business and Spirituality…How to achieve success in design. Attracting everything you want in your business. Learning what question to ask that open new ideas and generate new concepts. Nar Bustamante is president and principal designer of Nar Fine Carpentry, Inc. located in Sacramento, California. He is known for his modern eclectic and artistic designs. He has changed and reinvented the rules in California, redefining kitchens and homes into a complete new genre that speaks for its own brand. Nar Bustamante has received over 60 Local and National awards for his work. He has also been recognized in a multitude of National and Local publications. He relentlessly continues to produce unique projects never leaving room for predictability. Lighting is a continually changing industry. LED products are going to be the main light source on your projects, if it is not already. When preparing a lighting plan it is important to understand the differences in LED products. Besides LED technology, connected home technology is coming to be expected on quality projects. Connected home is the ability to control wired lighting and natural light with wifi technology. We will go over these items and more to help you make your design complete and to help meet the expectations of clients. How LED lighting products differ from each other? How the quality of light will affect the way your projects will look? How your clients will interact with lighting and with connected home technology? The additional design opportunities available with LED technology. Wendy Lofing-Rossotti is the third generation co-owner of Lofings Lighting, Inc., a Midtown Sacramento Institution since 1961. Lighting is a family tradition; Lofings was established in 1961 by Wendy’s Grandparents and Father. Wendy has a business finance degree from Sacramento State University. With her finance background Wendy is the Treasurer for Lofings. In 2013, Wendy was awarded the American Lighting Association’s Pillar of the Industry Award. This is a great honor as it is only awarded to three ALA members per year; (a manufacturers’ representative, a showroom owner/representative and/or a manufacturer). She is one of only fifteen lighting showroom members receive to this award since 1999. She was instrumental in establishing a webinar series on key topics for ALA education, was on the membership committee and served as a moderator for many showroom network groups for ALA members. Living and working in California she was also recognized for her participation with the American Lighting Association government affairs committee regarding the regulation of lighting industry in California. As a highly respected member of the lighting industry, manufacturers call on Wendy’s technical and design expertise to evaluate new releases and get ideas for new products. Over the years she has visited many manufactures and participated in many technical training classes. She has worked on many residential and commercial projects. The Lofings are known for their understanding of technical lighting products, lighting control systems and how to correctly apply them to lighting designs. Wendy is a past President of the Midtown Business Association, a past President of Executive Women’s International Sacramento Chapter, and she has served on various committees for the American Lighting Association. In addition to the office of President she has served as Vice President, Treasurer and Secretary for both the Midtown Business Association and Executive Women’s International Sacramento Chapter. Wendy is born and raised in Sacramento. She lives in Land Park with her husband Paul, son Anthony and dog Rio. Note: Last years NKBA Winning Competition Design Posters can be picked up at the September 14th Chapter Meeting. 1st Annual Sacramento Regional Design & Build Expo: Proudly Presented by JennAir and Featuring America’s Got Talent & Sacramento Artist David Garibaldi & Sacramento’s Benefit Auctioneer David Sobon! 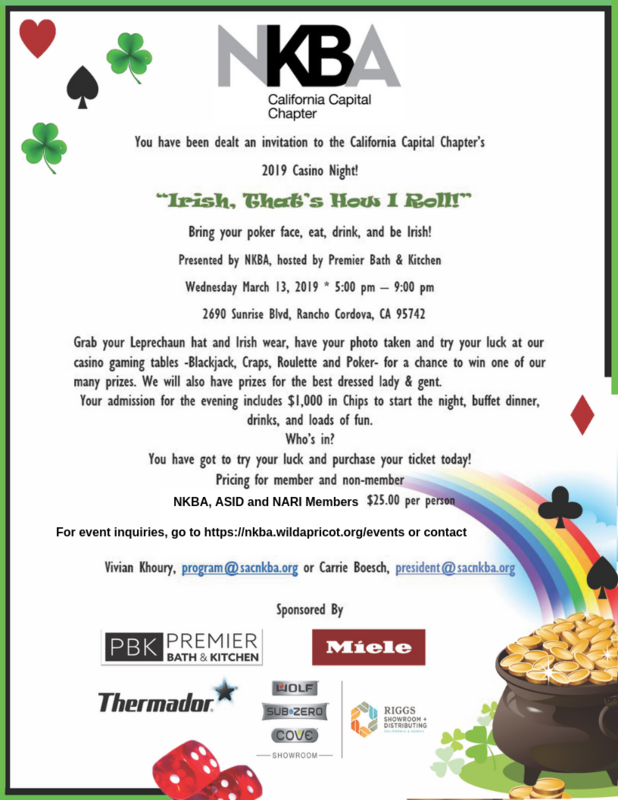 Money raised will be used to benefit the NKBA CA Capital Chapter, protecting our right to practice, providing educational scholarships as well as continuing educational units (CEU’s) for our membership and a portion will be donated to Habitat for Humanity. In today’s world, it’s not enough to “solve” problems. As the thought-leader Daniel Pink explains, finding and anticipating problems are more valuable skills than solving them. This new skill set requires insightful thinking and decision-making that is not linear in nature. Tackle “information overload” and be decisive, not overwhelmed! It’s difficult and stressful keeping up with technology and client deadlines. Through interactive lecture, small group exercises and personal worksheets, learn how to use, strengthen, and trust intuitive skills to make fast and accurate decisions in your career and personal lives. Understand the differences between instinct, impulse, emotion & intuition. Identify and test intuitive styles to gain confidence in their use. Discuss obstacles to using intuition in the workplace. Create an inspired and effective action plan based on intuitive decisions that accurately reflect and support your highest goals. Your most important “product” is your creativity. Clients and employers expect innovative and creative solutions to their complex design problems and depend upon you to deliver results. It’s critical, therefore, to be good stewards of your most precious resources: your time, creativity, and energy. Learn how to cultivate inspiration and manage time wisely with a healthy work/life balance based on core values and a visionary outlook. Without it, you quickly burn out and produce mediocre results. Sustainable design is not just a trend in the built environment, but a lifestyle that can maximize your talents and personal fulfillment through a renewable and inspired process. Discuss the direct correlation between sustainable design concepts, creativity and work/life balance. Identify & reclaim core values to properly apply time management tools. Create a personal benchmark and action plan for defining “success. Presented by Liesbet Trappenburg: Dutch-born, Liesbet has corporate experience in sales and management positions in Fortune 500 companies such as Irving Trust and Eastman Kodak. She’s also experienced 3 recessions and several identity crises! Since 1995, she’s inspired real changes for professionals through her keynote speeches, seminars, and corporate retreats on work/life balance, intuitive leadership, and authentic branding. A popular ASID Distinguished Speaker (2008-2013), Liesbet’s clients also include: IIDA, IFMA, NKBA, IIDEX Canada, Antron/Invista, Allsteel, BUILDEX Canada, Art Institute, Boeing Co., DuPont, Metropolis Magazine, and Gensler Architecture. There are 0.2 CEU’s available for this event. Living large in small spaces reviews the philosophy of those who elect to streamline their living quarters. When did this trend start? What are some suggestions for implementing this compact living fashion? What are the installation details to be discussed? Ace has worked for BSH Home Appliances for nearly fourteen years. Ten years in the small appliance division and four years as a National Product Trainer. Ace looks for the “WOW” in appliances and how they can fit the needs of the consumer. Ace lives in Antelope, CA, has been married “forever” with four children and 12 grandchildren. Presented by Kathleen Jennison, an award winning Certified Interior Designer and General Contractor in Stockton, California. Currently serving as President of the ASID California Central/Nevada Chapter and Marketing Director of the Great Sacramento NARI Chapter.